It’s the beginning of the end as we know it. Tonight marks the first episode of the seventh season of Mad Men. While this is the last season of Mad Men, it will go on a little longer than expected, given that this season has been split in two halves. Splitting final chapters in two is a popular trend now, and it is the only thing that Breaking Bad, Nymphomaniac, and Divergent have in common. The sixth season of Mad Men was a bit of a creative letdown that ended with a finale that promised a very important season to come. I am interested to see how these next two seasons will be structured. Either way, each episode will be incredibly important. Now that there is an end in sight, that means that each episode will be building to something bigger. Expect some important decisions, emotional revelations, and internet fan theories that prove to be completely wrong. You still have a few more hours until the new season of Mad Men premieres. I decided to spend that time thinking about which episodes mattered to me the most. This show’s very best episodes prove that Mad Men is more than just a show about an ad agency in the 1960s. 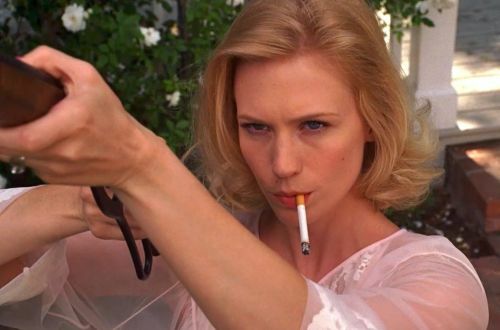 Betty Draper gets a lot of crap for being Mad Men‘s most boring, typically grating characters. Those criticisms aren’t necessarily wrong, but they overlook what a different character she was in season one, and how much of her downfall has to do with Don’s infidelity. Anyway, “Shoot” showed that Betty still has a spark of life left in her. It’s hard to forget how awesome Betty looks with a gun in hand and a cigarette in mouth. Images like this are probably the reason why America is so obsessed with guns and cigarettes. Plus, this episode has Pete Campbell making a good decision for once. It’s fun when a TV show lets its characters do something against type every once in a while. Once again, Connecticut is portrayed as “the land where white people move to the suburbs and then get sad that they don’t live in Manhattan anymore.” Okay, so that’s fairly accurate. In some ways, “Signal 30″ is one of the least eventful episodes of Mad Men ever, yet it feels like the whole world has come crashing down once it ends. Mad Men has always been about the fear of not knowing what will happen next, but “Signal 30″ is about the fear that nothing better is yet to come. Plus, this is the episode where Lane punches Pete in the face. While this was a long time coming, you will end up feeling bad for Pete. Leave it to Mad Men to make you feel bad about something that should have been cathartic. Much has been said about “The Suitcase,” and most of that stuff is much deeper and better than anything I can ever come up with. Quite simply, “The Suitcase” contains the best writing of any Mad Men episode to date. This is the episode where all of the wounds in Don and Peggy’s contentious relationship finally opened. It is the episode where Don finally exposed some of his deepest insecurities. It’s the episode where Duck Phillips tries to poop in Roger’s chair. In short, “The Suitcase” contains everything I love about Mad Men. Season five was the best season of Mad Men yet, as it took the show to places well beyond what anybody could have imagined from its original premise. “Far Away Places” feels more like David Lynch than Matthew Weiner, with a majority of it feeling like it could have taken place in Don’s head. This episode is told in vignettes, and earns “legendary” status from Peggy’s movie theater encounter and Don and Megan’s fight over ice cream in a Howard Johnson’s. However, what truly makes “Far Away Places” a series best is Roger’s acid trip. You know, the one where Roger hears opera coming out of a bottle of whiskey as “I Just Wasn’t Made For These Times” also plays in the background. It might seem unfair to rank one episode off of one scene alone, but the scene really is that good. This was the finale to season three, a season that was only occasionally good. To me, this is still the best episode of Mad Men. This is the one in which Don finally decides to jump the sinking ship that is Sterling Cooper in favor of a new company that will finally have his name on it. It is an episode filled with the kind of bold business decisions that might have been boring in other circumstances, but are so compelling here. But of course, no good thing happens on Mad Men without a bad thing happening first, and this exciting new chapter in Don’s life is marked by the complete disintegration of his marriage. As the show was beginning to get a little stale, “Shut the Door. Have a Seat” saw Mad Men tinker with its own formula with thrilling results. Again, Mad Men is about the uncertainty of the future. Yet, this is the first time Mad Men tried to embrace blind optimism, and it worked. This entry was posted in Uncategorized and tagged AMC, Analog This, Don Draper, Elisabeth Moss, January Jones, John Slattery, Jon Hamm, Mad Men, Matthew Weiner on April 13, 2014 by ian0592.